Are Knitting and Sewing the Same? Is Crocheting Easier? When it comes to sewing, reading a pattern is just the tip of the iceberg. In order to create fabulous clothing that will fit us like a glove, we need the right needles and threads. But how do we decide which ones to use? Are there any rules to this game of constructing clothes we cannot find in fast-fashion stores? Well, it seems there are — and we’re about to reveal all the secrets. As many of you probably already know, dealing with lightweight fabrics is especially tricky. Go just one size up in terms of the needle, and you’ll be left with holes in your light-as-a-feather curtain. So the basic rule is this: the thicker the fabric, the bigger/thicker the needle. The vice versa also stands — for sewing lightweight fabrics that are almost transparent, we need to use thin needles. But what if we want a decorative stitch on a lightweight fabric? Surely thin threads and needles wouldn't help us there. Thus, we would have to judge which ones we should use based on logic. In essence, we ought to balance out the thickness of the needle and thread with the lightweight fabric by going for those notions that fall right in the middle. In any case, if we’re not sure which ones we should use, the best thing we could do is try our tools on a piece of scrap fabric. Better safe than sorry — this will allow us to test the fabric for holes and understand if we have to go up or down a size in terms of thread and needles. Darning — we want to repair some holes, rips, etc. Embroidery — we’re looking to embellish our clothes. Here we have many options, as embroidery can be done with various threads of different thickness and by using a multitude of techniques, such as cross-stitch, needlepoint, blackwork, and others. Basic sewing — entails using a pattern (from a magazine or our own) and creating clothing according to it. All-purpose — medium thick thread, perfect for a variety of materials such as linen, rayon fabrics, and lightweight and medium cotton. Perlé — specific type of thread used for embroidery; gives a nice sheen to the garment. Stranded — consists of six loosely woven strands; mostly used in embroidery. Coton a Broder — again, mostly for embroidered pieces, as it’s quite smooth and perfect for details. Quilting thread — all-cotton thread for quilting projects. Flower thread — thread that gives embroidered items an almost vintage feel; it comes with a matte sheen, and it’s very soft, so it’s best when used on small-count fabric. Bonus: tatting thread — this one is used for tatting projects (durable handcrafted lace), but it doesn’t have to be cotton thread. We can also use wool thread and nylon ribbon. We mostly use wool thread for embroidery projects and for sewing soft pieces of clothing. One of the thickest wool threads is the Persian thread, which consists of three divisible strands. A medium-thick one would be the tapestry wool thread, while the finest of them all is the Crewel wool thread. We can use it for embroidered pieces that require flat stitches. It’s a type of fine thread that's great for synthetic fabrics of light to medium weight. In general, silk threads are fantastic for sewing with wool or silk, but we can also use them for basting. Their main feature is the fact that they don’t leave any holes. Among many types of silk threads, there are four we should remember: silk floss (high sheen), twisted silk (consists of several strands), stranded silk (sparkly thread with divisible strands), and silk ribbon (mostly for decorative pieces). Used for embellishment and goldwork (in essence, when we want to give our clothing a touch of class); the most common types are Purl and Japan threads. Bobbin threads — the regular ones that go into the sewing machine; quite affordable. Variegated thread — mostly for embroidery; comes in crazy vibrant colors. These are the ones we will most often use, as they work pretty well on most fabrics, including the stretchy ones. Moreover, polyester threads are strong, and they come with a waxy finish, almost silicone-like, which allow them to go through the material quite easily. However, do be aware of the finish — it will be a bit shiny. All-purpose — cheap and accessible, this is the one we’re most likely to use first. It’s polyester thread that comes wrapped in cotton. Thus, it has all the best features of polyester, but it doesn’t give the clothing a shiny finish. 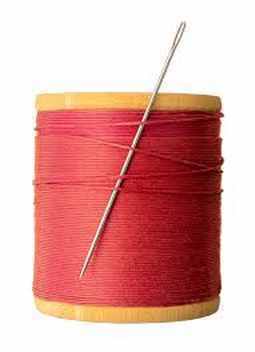 Invisible thread — if we have something to mend or sew, but the thread should be practically invisible, then this is the one we will use. Apart from being almost transparent, it’s also quite strong. Elastic thread — used for gathering the fabric. These consist of various other combinations of threads, like silk and rayon thread for example. Although usually made from cotton, polyester or cotton-wrapped polyester, we’re mentioning heavy-duty threads here because these are some of the thickest ones we can use. Thus, heavy fabrics, such as those used for upholstery, go hand in hand with these sorts of threads. Usually, they come in size 40 and would need to be threaded into an appropriately big needle. Although it’s tempting to spend a few dollars on cheap thread, we need to be aware of one thing: our clothing will be only as good as our fabric and threads are. So if we don’t want all our hard work to go down the drain, sewing with expensive thread is the best option. Cheap threads are notorious because they can easily rip even before we actually put the clothes on. Moreover, they can even rip while sewing, which can prolong the process, as we would have to rethread, try again, etc. Thus, in order to make sewing easier not only for us but for those who’ll have to hear our despair whenever the thread breaks, expensive threads are a must. Threads can come in many colors and in various shades. However, choosing one will depend on the color of the material. There isn’t a rule that says we have to match the color of the thread with the color of the fabric. If we are going for a special look, we can always just choose complementary colors. That will easily give an edge to our clothing and make it that much more unique. Still, if it’s crucial that these two notions match, the easiest way to pick the thread is to take one piece of it and lay it on top of the fabric. One more tip — if we decide to sew something from a pattern, then we ought to read it carefully. Most of the time, the patterns come with thread recommendations, so if we don’t know which one to use, it will give us the answer. Also, know that if you match the material of the thread with the fabric, you probably won’t make a mistake. When in doubt, opt for cotton thread for natural fiber materials and polyester thread for synthetic fabric. Now, some of you might be wondering why it’s important to choose the right size of thread to match the needle we’re going to use. Well, it all comes down to what we’re making and whether we want the thread to show. Indeed, the thickness of the thread will affect its durability and strength. Moreover, it can limit us to a particular type of sewing machine, as not each one is meant to be used with thick threads. Finally, the thicker the thread is, the more likely it is to show both in the front and in the back of the fabric. So it’s important to choose wisely! Let’s start with the most basic needle guide that you can use for your everyday sewing projects. Universal Needles — multi-purpose needles that come with a somewhat rounded tip; perfect for woven fabrics and knits, but exceptionally great for cotton, poly/cotton, and silk. Ball-Point Needles — these come with an even rounder tip than universal needles, which is why they're perfect for slipping between the fibers of woven and knit materials (polyester and poly/cotton especially). Stretch Needles — for sewing swimming suits and clothes out of elastic materials and lycra. Quilting — specially designed for quilting projects; strengthened needles that can go through thick materials and multiple layers. Leather Needles — these come with a cutting point, which we would need, as piercing leather and thick vinyl is impossible with regular needles. Jersey — specially designed for knit materials, these have a rounded tip that doesn’t cut through fibers. Topstitch Needles — for decorative stitches and topstitching, we need needles that have a larger eye in order to thread thick threads through them. Microtex/ Sharps — a bit like the universal needles, but strengthened. They are also much finer and sharper than the universal ones, which is why they are perfect for densely woven materials, silk, appliques, and thin vinyl. When choosing our needles, we need to be aware of the fact that each pack will have either the European or the American size on it, or even both. However, these numbers are quite different. The smallest number indicates the American size while the bigger one is the European size. 60/8 and 70/10 — very thin and delicate materials, such as organza, silk, fine lace and chiffon. 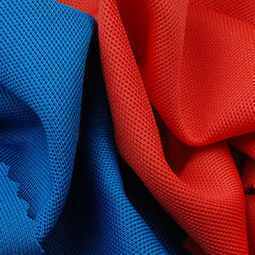 75/11 and 80/12 — lightweight fabrics, such as spandex, cotton, silk, cotton voile, and synthetics. 90/14 — medium-weight fabrics, such as linen, muslin, tricot, sweatshirt knit, light wool, thin corduroy, and fleece. 100/16 — heavy-weight materials, like leather and corduroy, as well as denim and canvas. 110/18 — heavy fabrics that require thicker thread, like faux fur, upholstery materials, heavy canvas, and heavy denim. When we’re trying to sew perfect clothing for ourselves, we have to take thread thickness into account. What’s also important to note here is that thicker threads are more likely to be seen on the clothing. So if we want to avoid having our dresses look very handmade, we ought to select thinner thread that will make the seams look flawless. But what thickness is the best for the materials we’re going to use? Well, that question doesn't really have a clear answer. Because there are a few different ways we can measure thread, most manufacturers don’t stick to the formulas perfectly. So in essence, it’s always better to look at the material and determine the thread thickness by knowing which needle size we need to use. Commercial (V) — thread’s denier divided by 10, usually used for very strong threads for upholstery, webbing, and canvas. Very Heavy — needle: 140, 160; tex: 105, 120, 135+. Confused? Probably. In the end, the level of expertise we have in sewing will make it easier for us to determine the thickness of the thread we need by just looking at it. Moreover, we can always logically deduce that if we want to sew something from leather, for example, we’ll, of course, need a larger needle and thicker thread. Finally, there’s one good tip you can always use: the best results come if the eye of the needle is about 40% bigger than the thread’s thickness. 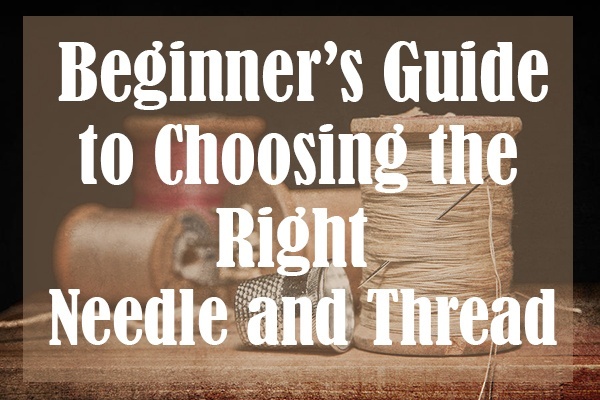 In order to help everyone, we’ve decided to actually put in the effort and make a guide for the most common sewing projects and the types of needles and threads they require. Without further ado, let’s learn even more about sewing! Like we’ve already mentioned, there are specialized leather needles available in sewing stores. These are much stronger and thicker than regular universal needles, and they also come with a sharp triangle at the top. Thus, with such a needle, we can easily pierce through most leather, even the thicker kind. As far as the thread goes, we won’t go wrong with nylon threads here. But remember — we need to adjust the thickness if the leather is thick as well. Topstitching thread is the best option when sewing denim. However, if we don’t have it, we can always use two spools of thread to get more thickness. In terms of the needle, it needs to be thick and sharp, just like regular denim needles are. Nevertheless, for stretchy denim, we should opt for a stretch needle. Specialized quilting needles are our best bet here, although topstitching needles are a good option as well since they have a longer eye through which we can put a thicker piece of thread. Free-Motion Quilting — depends on how much we want the quilting to stand out. A good option is monofilament thread, but we can also opt for polyester, cotton or cotton-poly blend thread. Most of the time, sewing knits is a bit difficult as not using the right needle could lead to skipped stitches and holes in the material. Because of that, our best bet is to use a ball-point needle or even a stretch needle (sizes 75/11, 80/12 and 90/14, depending on the heaviness of the fabric). Meanwhile, in terms of the thread, there’s nothing special we would have to use: just regular polyester thread. Don't get confused when shopping for threads and needles if you want to sew jersey. Jersey is a type of knit fabric, so everything we mentioned for knits goes for the jersey as well. 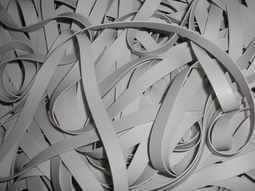 For rubber, although there aren’t really specialized needles, we can easily opt for those used for leather, denim and other heavy fabrics. However, they have to be thick, at least size 14. Moreover, the thread also has to be thick, and cotton is the preferred fiber. Of course, for stretchy fabrics, we ought to use a stretch needle. However, a ball-point one would do well here too. The thread should be a regular polyester one, as that one has a bit of stretch in it. But we should never use cotton here, as it will easily break once we pull on the material. Although we wouldn’t recommend sewing with silk if you’re a beginner, over time, you’ll learn how to use this wonderful material to your advantage. Still, the most important thing to remember is that this sort of material is lightweight and slippery. So apart from some weights that will hold down the fabric, you will also need to use smaller needles, like 60/8, 70/10 and 80/12. If the material is densely woven, then a microtex needle is your best bet. The thread should also be delicate, but strong. However, note that for man-made silk, you should use 100% polyester thread. Meanwhile, for 100% silk, use cotton. A universal, sharp yet thick needle in the size 14 or 16 is our best option when we want to sew velcro. Meanwhile, in terms of the thread, we can safely opt for affordable polyester threads, as these are strong and durable enough for this sort of project. Velvet is a very unforgiving type of material because the stitches easily show on it. Thus, when sewing it, we ought to first determine its type. If it’s traditional velvet, then a 70/11 microtex needle is a good option. However, anything heavier than that requires a sturdier needle. Moreover, if we’re dealing with stretchy velvet, we should opt for a 75/11 stretch needle. The thread is an easy choice, though — we cannot go wrong with 100% cotton or silk thread. Since voile is a semi-sheer, soft fabric, we ought to use something dainty for it. Thus, a universal point needle or a size 11 sharp is going to give us fabulous results. However, if we’re able to find a size 9 sharp needle, then even better! Finding the right thread for this fabric, though, is a bit tricky, as the best option is cotton embroidery thread. This type comes in various colors, so we can really go to town in terms of creativity. But if we cannot find that thread in our local store, then 100% cotton or cotton-covered polyester thread is a fine choice as well. If we’re not going to keep tugging on the material, then general-purpose thread is a great option for sewing vinyl. However, if the items will experience some stress, then we should opt for something stronger, like industrial or heavy-duty polyester thread. In terms of needles, it’s very simple — use a universal 100/16, leather 90/14 or a denim 90/14 needle. But note that if the vinyl is thin, you’ll need a thinner needle so as not to ruin it completely. For sewing cotton, we should opt for needles 75/11 or 80/12, as these are perfect for such lightweight materials. Meanwhile, all-purpose cotton thread is our best bet, as it will match the fabric. Since satin is a delicate material, we ought to use small needles, like the 60/8 or 70/10 microtex. Moreover, the needle has to be sharp, and the best thread to use is the cotton-wrapped polyester thread or special lingerie thread. For fleece, we will get the best results if we use a ball-point needle. Since it doesn’t have a sharp point, it won’t pierce the fabric but slide between the tiny loops in the fleece. Meanwhile, the thread should be strong polyester thread. Just like satin, chiffon is one of those slippery materials that could give us a real headache. Thus, it’s best to opt for the most high-quality tools when dealing with it, like a 70/10, 65/9 or 60/8 size needle and fine cotton or cotton-covered polyester thread. When sewing spandex or lycra, it’s crucial to ensure that we’re using a ball-point needle. This one is perfect for most knits. However, if we have the option of using a stretch needle, then we can opt for that one as well. That way, we’ll prevent skipped stitches while sewing. Also, note that stretch and jersey needles are also ball-point needles, so don’t be confused if you get those in the store. As far as the thread goes, polyester is a fine choice. Nevertheless, if we decide to also use a serger or a coverstitch machine, then we can even opt for wooly nylon thread. This one will be especially good for loopers. Depending on the weight of our linen fabric, we can opt for a size 14 or a size 10 needle. Meanwhile, the thread should be lightweight, preferably all-purpose cotton. If the lace is stretchy, then we will, of course, use stretch needles for it and determine the size according to the thickness or weight of the material. However, we can use universal needles (60/8, 65/9 and 70/10) for normal lace, and all-purpose sewing thread to sew it. For nylon, we’ll need medium-sized needles, like size 12 or 14 sewing needles. However, the tricky bit here is finding the right thread. Even though one would think cotton is a sound choice, we should never use it for nylon. Instead, we should opt for commercial 100% nylon or polyester thread. Being crafty doesn’t mean that we always have to use regular fabric. We can also sew paper and decorate our homes with the designs. However, paper can be quite rigid, and it has a tendency to dull the needles. So when sewing paper, we should opt for heavy-duty needles, like a 16 denim-grade needle. The thread options are endless, though: metallic, embroidery, variegated, and rayon threads will certainly do the job well. Any type of polyester can become a wonderful piece of clothing with ball-point needles and polyester thread. For rayon, we’ll first need to prepare the fabric by washing it, drying it and ironing it beforehand. Then, when it comes to sewing it, we’ll need to get a thin and very sharp needle, like a microtex 70/10, or a universal needle. Meanwhile, the thread should either be poly-blend or polyester. Most designers use tulle for dresses, especially wedding dresses that should be quite airy and delicate. So if that’s the look we’re going for, we’ll need to use a thin needle, for example, a size 70 needle. However, since tulle is a bit static, we should use cotton-covered polyester thread with it. Everyone loves a cozy flannel shirt, but just imagine how incredible it would be to make one on our own. And trust us — it’s not that difficult. All we’ll need is an 80/12 size needle (a new one because flannel can easily dull needles down) and all-purpose polyester thread. Now, before sewing burlap, we’ll have to consider the type we’re using. There’s laminated, fire retardant and bituminized burlap, and all of these can be used for a variety of designs. Still, if we’re using a sewing machine, we ought to go for 60/8 or 100/16 needles. Meanwhile, hand sewing requires needles that go from size 5 to size 7, depending on the fabric. For burlap, we also have three thread options: all-purpose cotton, polyester and cotton/polyester blend. Now, most bathing suits need some kind of stretchy fabric, but there’s also specialized fabric just for them. However, it’s very tricky to work with, and it requires a lot of skill. Still, we can use a stretch needle or a ball-point needle for this project (size 90/14, for example), and of course, polyester thread because cotton would snap easily on skin-tight swimsuits. Most often, blankets are made of fleece or wool. 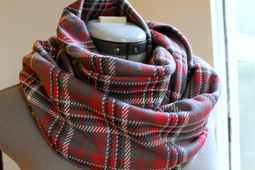 Thus, we can use the above-mentioned fleece needles and threads for sewing a cozy blanket for our children or us. However, if we opt for wool, then a ball-point needle is our best option in combination with silk thread. Cotton thread is also a choice, but the silk version is a lot more durable and neat-looking. Canvas is a tightly woven cotton fabric, which means that it’s also going to be heavy. Thus, we'll have to opt for a bigger needle here, like a 90 or 100 universal or jeans needle. However, if we decide to add some decorative stitches, then a topstitch needle is going to help us out big time. As for the thread, the choice depends on the type of canvas we’re using. If we’re sewing something we’ll use outdoors, then marine thread is a fine option because it can withstand being exposed to the elements. But in any case, we’ll need heavy-duty thread, possibly in size 40, and it should be polyester, cotton or cotton-wrapped polyester. Other options are wool and upholstery threads, but these might not go well with our sewing machine and the bobbins. Since curtains ought to be flowy and delicate, we’ll need a smaller needle, unless the fabric is thick. Hence, universal needles in the sizes 70, 80 and 90 should work just fine. As for the thread, we should opt for an all-purpose one, either cotton or polyester, depending on the material we’re using. Dog collars, although fun to sew, are tricky because we would first have to determine the right material for them. Most often, people opt for leather or some other similarly thick material. Even denim is an option! However, in terms of needles and threads, everything is clear. We’ll need a 14-16 size denim sewing needle and thicker polyester thread. Just like with other leather items, for this type of a project, we should use a sharp and brand new leather needle and choose the thickness according to the type of leather we’re using. 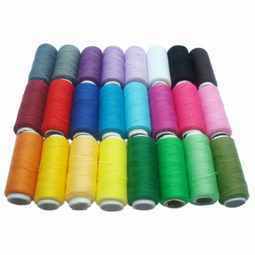 As for the thread, we can use thick polyester thread. We need a great steering wheel cover to match our new leather car seats, right? Well, you’ll be happy to hear that the needles and the threads are practically the same. However, do note that steering wheel covers go best with thin leather, so we’ll need a thinner needle and thinner thread for this sort of project. Also, consider first using a dry sewing technique (punching the holes first with a size 18 needle, for example) and then hand sewing the rest of the cover. That’ll surely spruce up the entire look of the wheel! Making our boat look extra fancy won’t be too difficult with a brand new and entirely unique boat cover. Apart from the material (something sturdy that won’t stretch at all, like Sunbrella), we’ll also need V-69 polyester sailmaker’s thread and a size 18 needle. Silk, satin, chiffon, and lace — we can use all these fabrics to create a custom dress for ourselves and use the corresponding needles mentioned earlier. However, another material that’s great for these dresses is organza. If we want to sew organza, which is a rather stiff silk material, then we’ll need a size 8 to 11 universal needle, or a small needle that comes with a sharp point. Meanwhile, the thread we’ll use should be regular weight cotton. For best results, we can use canvas, as that material is an expert at withstanding heat, rain and other weather conditions. But, we can also opt for more heavy-duty materials that are specially designed to be used outdoors. If we choose those, then we’ll need the right thread, so nylon, polyester, PTFE (Polytetrafluoroethylene) or monofilament should be on our to-buy list. Moreover, depending on the thickness of the material, we can use either a size 16 or a size 18 universal needle. Used both outdoors and indoors, the Sunbrella fabric is a heavy-duty material that’s sturdy enough to combat extreme weather conditions, as well as mold and mildew. However, in order to sew it, we’ll have to use strong polyester thread that has UV protection and is mildew resistant. Moreover, the needles have to be thick and sturdy as well — sizes 18/110, 19/120, 20/125 and 21/130. The type of needle and thread we use for this project will depend on the fabric we go for. If we go for canvas, then thicker threads and needles are needed. However, bags and backpacks can also be made from lightweight materials, which can withstand the use of regular polyester threads and universal needles. Still, do know that we can also sew heavy-duty backpacks at home. But for those, we'll use ripstop nylon fabric, velcro and something thick like 1000 Denier Cordura fabric. Those would require thicker polyester threads and bigger needles, like those we can use for leather and denim. Monofilament thread, also known as the invisible thread, has become quite popular over the years, as seamstresses have gotten tired of having to hide the seams by being innovative all the time. However, which one is the best? Well, it depends on what we’re looking for. These threads can come as nylon or polyester threads, and they’re both good in their own way. Nevertheless, most people prefer invisible nylon threads, as they are, well, more invisible than the polyester ones. Yet, polyester threads have a neat feature to them: they can withstand higher temperatures and UV light well. In the end, we can figure out which one is the best for our own sewing machine by trying each one. In any case, they’ll be invisible, so it’s just a matter of determining which one is stronger. But given that neither of these is cotton, we could recommend either one. Now, this is a trick question, as we can do many of the stitches our sewing machine does by hand as well. Thus, even the choice of the thread will depend on what we’re doing. For everyday hand sewing, such as repairing ripped socks and similar items, we can always use regular cotton thread. However, just to make it a bit more stretchy, cotton-covered polyester thread might be a better choice. In any case, the best thread for hand sewing is the one that matches both the fabric and the needle. Still, it has to be high-quality, as hand sewing takes more time than machine sewing. Moreover, since we’re the ones doing it, we’re prone to making lots of mistakes that cannot withstand cheap threads. Buttons come and go, and we have to keep reattaching them every once in a while. However, most of the time, we sew them in with a button attachment add-on or by hand. In any case, we need to use thick thread or double thread to secure them in place. For each button, use about 12″ or 24″ of thread (if using the double thread technique). The type of thread is not too important, but usually, general-purpose thread or mercerized cotton is the best option. Hopefully, you’re now ready to conquer the world of sewing with your very own collection of needles and threads. 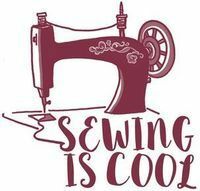 Still, don’t forget to share this article with others and help them learn more about these sewing notions today. Also, if you love our guide, comment below and tell us your thoughts! Does Sewing Thread Expire? What To Do With the Old Thread?